This company won ISC West Best in Show 2 years ago, recently received $5 million in funding and is being talked about as the next big thing in security and surveillance for its 'revolutionary' incorporation of facial, voice and behavioral recognition. Indeed, this summer, FST21 has been touting a large New York City apartment complex as a success story. Multiple security trade magazines have done case studies on the project so we wanted to see what all the excitement was about for ourselves. We sent a reporter to Knickerbocker Village to take video of the installation and talk to some of its tenants. We were not the first to see SafeRise in action, but needless to say, our results are much different than the claims. We found the system was not as reliable or convenient for the tenants as the case studies make it seem and that piggybacking, doors being held open, new tenants and obscured faces were clear practical problems. Knickerbocker Village is a 12-building Manhattan complex that houses ~1600 people, with 4,000+ coming and going daily. The FST21 SafeRise system is supposed to be an easy way for residents to access their apartment building using facial recognition instead of a keycard (FST21 says the system can be configured for voice or facial recognition). 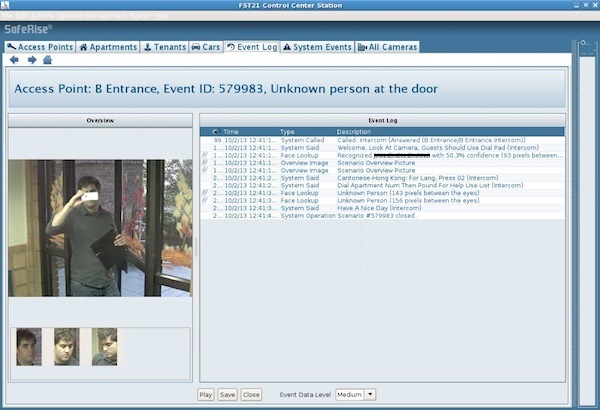 The premise is simple: If the camera sees a person enrolled in Knickerbocker’s database then the system should unlock the door and let them in. SafeRise was installed on one door last year, but it was destroyed by Hurricane Sandy. That camera was replaced at the beginning of this year. There are plans to expand the system to all 12 buildings in the complex (though it is deployed at only two currently). Knickerbocker hopes to phase out key cards and operate solely on facial recognition. Daniel Peled, FST21 vice president of sales says the cost of implementing this technology on one door (FST21's Digital Doorman solution) is $8,000 MSRP. “The whole complex is not commissioned yet, they are doing it in stages, starting from the interior building entrances, and then moving to the outside gates as well,” he said of Kncikerbocker. When a person first enters the lobby, here is the initial greeting. The red indication means the camera has detected movement. Peled says if five people walk in together, SafeRise can identify all five through images without having them queue up, however our video shows that when three people walked in together (two tenants and our reporter) it did not identify any of them. This video shows some people opting to use keycards instead of facial recognition and the system failing to recognize anyone when three people walk in. For unknown or known people who are barred from entry, the system is designed to send an alert to building security. The building’s manager told Security Today that he has not heard a single complaint about the system, but according to multiple residents, when the system was initially deployed it was unreliable. "At the beginning I had a problem, but I went to the office and they took care of it," the resident below says. "I love it. I think it's cool," he says. FST21 says it would be hard to determine why it is not working for some residents without being able to analyze each specific incident, but the first place would start is making sure the tenant is enrolled. Peled says the system should have a 99.7% accurate detection rate and in the past people who say the system never works for them were often not enrolled. At Knickerbocker around 500 people are enrolled. Nine out of 15 people either said or showed us that the facial recognition feature worked for them. For the others, the system didn’t recognize them, they used their keycards instead, and some refused to use the system at all. Paroulek says he is happy with how the system has worked so far. He says he likes that the system helps keep a more accurate record of who is coming in and out of the building. “We know that sometimes people like to trade off and give their cards to other people and then we don’t know really who’s coming in unless my guards see it,” he said. FST21 says the camera is placed 75 inches from the floor and can capture faces from children, people in wheelchairs and people walking upright. Enrollment pictures are taken from as close to the same height and angle as the person would be coming through the door, he said. As a person comes through the lobby door, they are in the center of the camera's field of view (see below). The ideal distance is eight to 12 feet from the camera, he said. "We will set the actual recognition spot at the most natural path that people walk through. Ideal lighting is 300 LUX, however since you have been at Knickerbocker Village, you know the lighting there is not nearly up to what is ideal, and the system still works great," he said. FST21 said the concept behind SafeRise came from the company's founder, a former Israeli general. "Trying to find all the bad guys isn't going to work. But you can identify the good guys," he said. "It's a different concept of security. The technology is to identify people. Identify people who have already enrolled. When we train people we tell them if you want to get in, show yourself ... Even people who make the most minimal effort to be identified will be successful." Even if the system is 99.7% accurate, as FST21 claims, the system will be frustrating to new users. FST21 said the system is most accurate after a person comes through six to eight times. As more people enroll, and SafeRise is added to more doors, there is going to be a constant population of new enrollees who are having issues with the system. User needs to present their face at an odd angle, tilting their face up and towards the corner where the camera is mounted. While the system may work quickly when properly presenting one's face, not doing do will cause many legitimate users to be denied entrance. While the security director implies that residents are trying to obscure their faces when wearing a hat, many people simply do not know that they need to remove their hat. Others, may not want to do so. Because people need to present their face and remove their headwear, many will make a mistake in doing so (e.g., forgetting to take off their baseball cap or looking straight ahead instead of at the camera). While this can be blamed on 'user error', either way, with so many residents, it will become a practical pain. Despite the ease the system is supposed to provide, some residents we spoke to still preferred the key card system and did not plan to enroll in the facial recognition system. This will cause problems when the complex decides to make all entrances facial recognition only. As the videos show, tailgating, piggybacking and letting other people in are still a problem. More than once people offered to let us in as we took video, and in one case facial recognition did not work for a two men without a keycard and they just waited until someone leaving let him in. Peled says the system can count the number of people passing the door and send an immediate alert and if needed lock the door, but a feature that can lock a door does not matter if a door is being held open. The system takes photos of people that try to enter and are not recognized and send photos and the alert to the security guards for review. This image below the reporter we sent taking photos of the camera. You can see on the right side of the screen a log of all of the alerts and messages broadcast by the intercom for that entrance. A significant limitation to this system is that it relies on a clear shot of a person's face to be effective against unknown visitors. If a person wears sunglasses or has a hat pulled low, the system has no way to recognize that a person entered the building. If they come in along with someone else, the system would never know someone piggybacked their way in. "What we've done in places that need a bit extra security is installed another mechanism that counts the number of people coming through the door. We check that against the number of people we saw and if that doesn't match it triggers and alarm," Peled said. On the positive side, the system works for most residences on an outdoor entrance. The challenge, though, is that an access control system needs to work virtually every time or else the level of complaints and inconveniences becomes unmanageable. Given the repeated user 'errors', new enrollment issues, and user objections, using such a system for more than a thousand people in a residence seems infeasible. By contrast, we suspect that this would operate far more effectively in a government or corporate facility where users would be forced and trained to use the system.